ArtYard is thrilled to host a special event with award-winning author Aracelis Girmay, popular poet John Smith, and the Sister Cities Girlchoir. 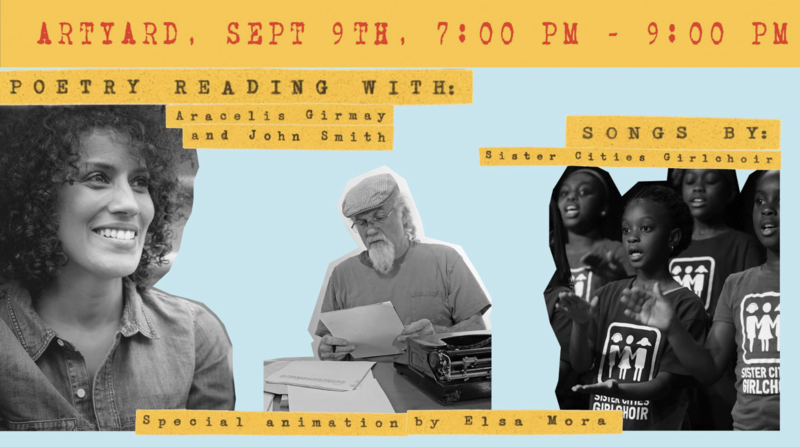 Please join us for an evening filled with poetry, songs, and the screening of a short animation by Elsa Mora. Aracelis Girmay is author of three books of poetry, the most recent, The Black Maria, the poet Rigoberto González in the Los Angeles Times describes “a blessing to the living and the dead, a tribute to lives lost, a song of hope, perseverance, and gratitude flourishing despite class conflict and racial strife.” In this event, the Award-winning Girmay, a virtuoso performer, will be preceded by a reading by the popular poet John Smith, a long-time Frenchtown resident, author of the poetry collection, Even that Indigo, a poet whose work has been published in numerous literary magazines and in NJ Audubon since the 1980s. Sister Cities Girlchoir (SCG) empowers girls by building resilience, leadership, mastery, and connection through a comprehensive choral training academy that invests in the unique potential of adolescent girls to break the cycle of intergenerational poverty and transform their communities. The program is research-based, and although a music program is an uncommon girl empowerment tool, SCG is modeled on the powerful impact that investments in the lives of girls make for a city block, a neighborhood, a city….for the world. Special animation by Elsa Mora. Elsa Mora will be presenting a short animation inspired by the Aracelis Girmay’s poem Elegy.